If you assume that there is not much textual analysis that can be squeezed out of a title then you need to consider the title that Müller gave to the book in which Die schöne Müllerin appeared: Sieben und siebzig Gedichte aus den hinterlassenen Papieren eines reisenden Waldhornisten. Herausgegeben von Wilhelm Müller . 'Seventy-seven poems from the testamentary papers of a travelling French horn player. Edited by Wilhelm Müller'. Wilhelm Müller, Sieben und siebzig Gedichte aus den hinterlassenen Papieren eines reisenden Waldhornisten, 1821, vol. 1, title pages of the volume and the Die schöne Müllerin. A facsimile of the volume is available online. Not only has Müller set up a fictitious author for his work and given himself as the editor but he has laid a patina of rustic authenticity over it by claiming that the author is a now dead travelling horn player. What japes! The Romantics liked to use masks and personae. The overwhelming majority of folk verses and songs that their era threw up were in fact completely new compositions, written in the manner they might have been if they had been written by rustics and not lawyers, civil servants and aristocrats. Whether Müller expects us to suspend disbelief in his absurd title or intends it as a little bit of decorative nonsense, a little bit of satire for his sophisticated, cultivated urban readership – well, who knows? Fifty years before this, the then Queen of France, Marie Antoinette – a girl whom we can never accuse of doing things by half – had an entire bucolic village built at outrageous expense in the grounds of her Trianon Palace and even used servants to act the part of shepherds and other rustics. 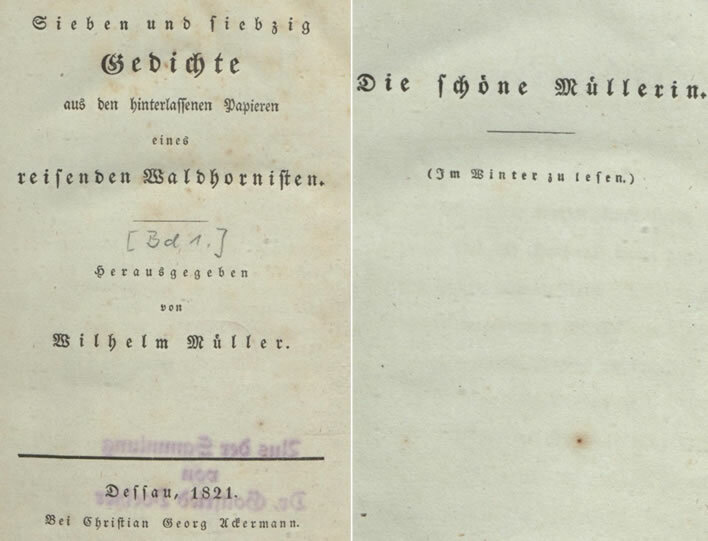 Moving on from the title of the collection to the title page of the poem group we note the title Die schöne Müllerin. This very attractive title is as much a cheat as the title of the book: the main character of the cycle is a man, the miller's apprentice and all action takes place from his point of view. Naming the cycle after a secondary character is really a bit odd. Underneath the title Müller adds parenthetically that the poems 'should be read in winter'. This puzzle is resolved in the 'Poet's Prologue', where we find the reasoning that, since the action takes place in flowery spring, the cycle should really be read in the depths of winter. We haven't even got to the poetry yet and we are already embarrassed at Müller's fussiness in spreading this trivial conceit over two pages. Would the true greats of German literature ever do anything like this? No. Schubert has the artistic confidence to throw out all Müller's mannered posturing with titles. He names his song-cycle cleanly and accurately: Die schöne Müllerin, ein Cyclus von Liedern gedichtet von Wilhelm Müller. In Musik gesetzt [von] Franz Schubert. 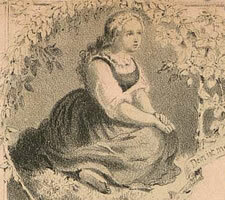 'The Beautiful Miller's Daughter, a cycle of songs written by Wilhelm Müller. Set to music [by] Franz Schubert'. In this change of title alone we can see the difference in artistic level between the genius and the plodder, the latter now about to be made immortal by the former. Having established that Die schöne Müllerin comes from the horn player's papers Müller now sabotages that persona by writing a Prologue 'by the poet', that is our dead horn player, not the 'Editor', Müller. Our wandering horn player now becomes a rather oily and ingratiating theatre compère without any empathy for the rustic characters of the play. Wem die behagt, der trete nur herein. Those who like it can just step in. Der Lenz mit allen seinen Blumen blüht. Spring is blooming with all its flowers. So ist der Kunst und euch genug getan. Sufficient for art and for you. Das ist ein junger blonder Müllersknecht. A young, blond, miller's apprentice. So wird ein Bach deshalb Person noch nicht. the stream is not yet thereby a person. Wer mehr gibt, als er hat, der heißt ein Dieb. Who gives more than he has is called a thief. From this excruciatingly bad piece of couplet-writing we learn that Müller's group of poems forms a play in a 'sparkling brand-new style'. Its setting is rustic. The season is spring. It may be a play but there is only one speaking part. There is actually a second speaking part, the stream, which, of course, is not a person. The final 20 lines just set out an unspecified rustic scene – the 'scenery flats' of the play, as it were – and so add nothing more to our understanding of the cycle. We leave them out, since there are limits to what a translator can take. The prologue is really just a left-over in print from the little theatrical pieces staged by the members of the cultivated salon that was held in the house of Friedrich August von Stägemann (1763-1840) in Berlin. Müller was a valued presence among the other greats of the Prussian literary elite who gathered there. The rustic bumpkins Müller portrayed could not be more different from the compère and his glittering audience – the brightest stars of the German cultural revival that was taking place in Prussia at the time, the high-ranking civil servants, the ministers, the professors, the writers and artists. In front of this sparkling crowd, is the prologue irony, mockery or just playing a role about playing roles? Indeed, has its mannered literary style anything at all to do with the poems it introduces and a young man's unrequited love? Your decision. Schubert left the whole prologue out. Quite right, too, we exclaim unisono. However, although the prologue is tosh, it is important tosh because of the meaning it had for Schubert. 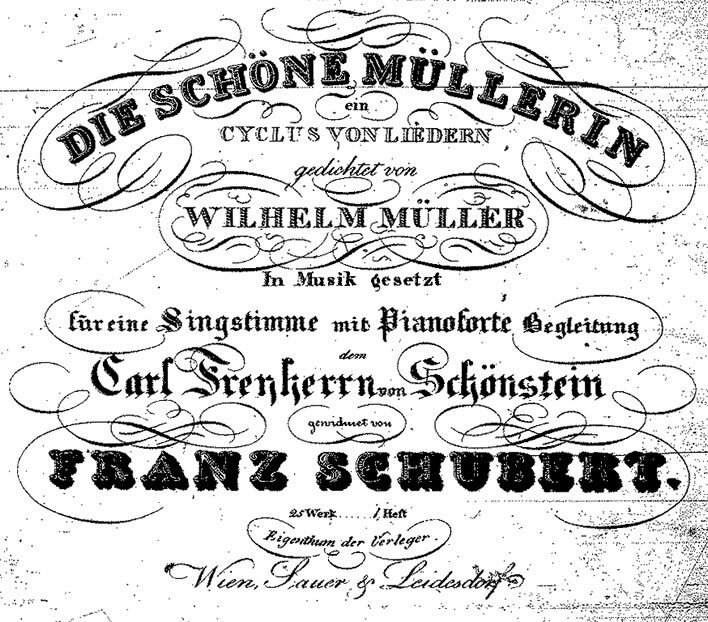 The fact is that Die schöne Müllerin marks the invention of the song-cycle. It is true that Beethoven got there seven years earlier, in 1816, with a group of six songs entitled An die ferne Geliebte ('To the distant loved one', Op. 98). However, unlike Die schöne Müllerin, they are just a group of thematically connected poems without any dramatic development or narrative. When Schubert read Müller's prologue, if he hadn't realised it before, he must have seen now that he had the next step in the development of the song-cycle in his hands: the 'monodrama' as Müller called it, the play with one speaker. It is, if you like, an opera with a single actor and no recitatives. As a teenager, less than ten years before this moment, Schubert did the same for the Kunstlied, the 'art song', that he now did for the song-cycle: he lifted it into a completely new artistic form. The man was a genius, at nineteen just as at twenty-six years old. One further thing we take from the Prologue: its assertion of a German identity. (We could write 'nationalism' instead of 'identity' but that would sound too negative.) 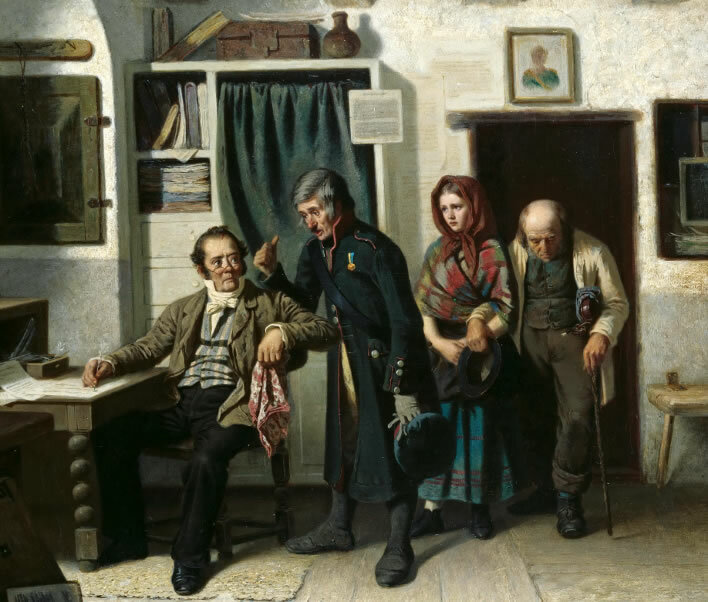 The first two thirds of the nineteenth century saw an ultimately successful effort to unify a German nation and culture out of the fragments left behind by three centuries of religious and political turmoil in Europe. This was as much a cultural movement as a political one. It also had class dimensions: until well into the nineteenth century in Europe French and Italian were the languages of the cultivated classes and their cultural preferences. Frederick the Great of Prussia, that figurehead of German success, preferred to use French or Italian, famously reserving German to speak to his horse. The rulers and administrators of the Austrian Empire communicated amongst themselves in French or Italian. There was indeed a culture of the common people, but it was a German-speaking culture and it was looked down upon by the aristocracy. This subject is much too big to deal with adequately here, suffice it to say that Schubert and Müller were men of their time and were part of the revaluation of German culture that was taking place around them. In his prologue Müller signals this German identity clearly and unambiguously. His miller's apprentice is here explicitly blond. We will be told in the poems of the cycle themselves that the miller's daughter is also blond. No swarthy French or Italians here. He also takes a few lines of the Prologue to tell us that his play is in a 'sparkling brand-new style', emphasise its 'simplicity' its 'artlessness' and its 'noble German roughness', implicitly compared with the effete French and Italianate stage products of the day. * The line about the roughneck lad picking a fight with a town soldier will be puzzling to moderns and needs a few words of interpretation. The soldiers who were stationed in towns at the time to enforce order and guard the town gates were not the wild bunch who did the fighting in the field. Their uniforms were on the whole smart, so that the image of the local lad taking them on in a scrap is a simile for Müller's rough and ready verses taking on the smart professional, official products of the time. There were many exceptions to this of course: particularly in peaceful times sufficient money for the upkeep of the soldiers was not always forthcoming. Carl Henrik D'Unker (1828-1866), Arrestmeldung ('Arrest Report'), 1857. A 'town soldier' at work. He has arrested an old man and his daughter who appear to have been begging and brought them before a town official. A structural analysis of the first twelve poems of the Die schöne Müllerin.